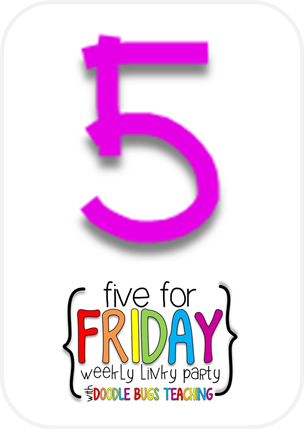 Firstie Favorites: Five for Friday: A Long Week! Wow! What a tiring week! We had parent-teacher conferences rescheduled for Monday night. I love meeting with parents and talking my kiddos, but it makes for a long week! I'm so glad that it's Friday and I'm ready to put my feet up tonight and RELAX! 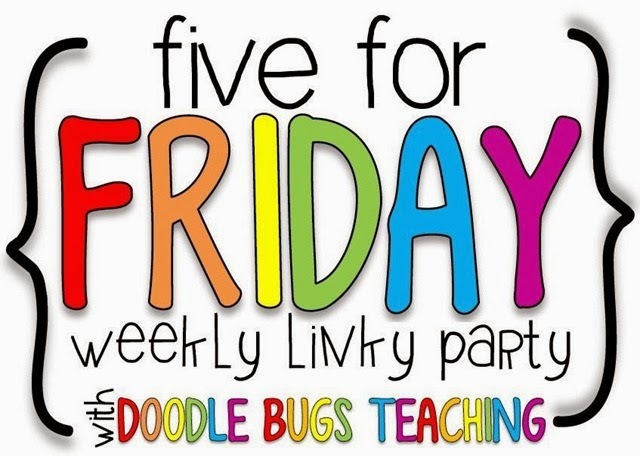 Despite being exhausted... here are the things that I am loving about my past week... linking up to Doodle Bugs! This week, we started talking about the difference between COMMON nouns and PROPER nouns. We started by creating this anchor chart so that students could see the relationship between common and proper nouns and their differences. 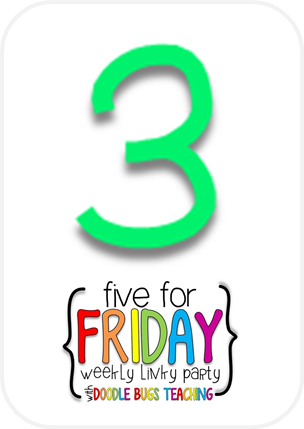 I recently invested in a fabulous Common Core Language Arts pack from Susan Jones on TPT. She has some great, interactive activities for exploring nouns, verbs, and adjectives. The next two activities are from her pack. In the following partner game, students roll a dice. If they roll an odd number, they cover a common noun. 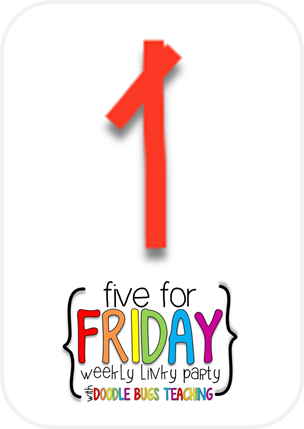 If they roll an even number, they cover a proper noun. The kiddos loved it! Several groups sat in front of our anchor chart while they played to that they could remember the differences between proper and common nouns. Then, we moved on to some "at your seat" work. Students used their highlighters to identify the proper nouns at the top of their page. Then, they changed common nouns in a sentence to more specific proper nouns to make the sentence more interesting (it gives the reader more details)!! We will continue to talk about common and proper nouns... we look for them in our reading groups and the books that we are reading. Next week, we are going to start learning about verbs! Woohoo! My district uses Everyday Math for our math curriculum and in our workbooks, they use Ds for Dimes, Ns for Nickels, and Ps for Pennies. I try to give my kids a lot of exposure to using actual coins while practicing counting money, but I find that they often struggle knowing which coin is which. Last year, I came across this simple game to help kids practice identifying coins. Students roll a dice and cover a coin on their board. 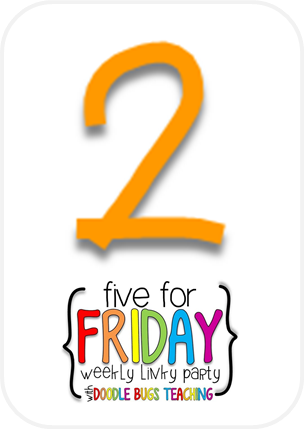 Visit Oceans of First Grade Fun for more money math ideas!! So last year, our district started using standards-based grading, which we are now calling "grading for learning." Throughout each trimester, we keep LOADS of data about our students' reading strategy usage, fluency, accuracy, comprehension, ability to read word families, sight words... ahh the list goes on and on... such useful information but it is all about organizing it to use it effectively! At the end of each trimester, we do more of a final check on each student's progress before we send home report cards. Last year, I felt like I was swimming in paper from all of my assessments that I was doing at the end of the grading period. Now that we have developed our common assessments, I came up with these handy little student data sheets.... One sheet, front and back, for each student.... OH MY GOSH! I am so excited to be organized and rid of all that extra paper! If you would like to see my full student record sheet, click the link. That's a peek at a few of our assessments! It is crazy how much better I feel about this! 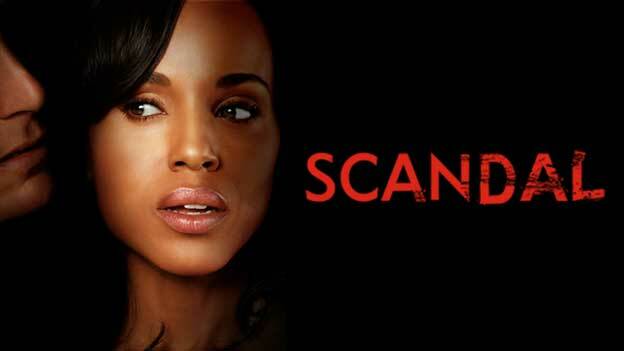 So I just signed up for an online streaming Netflix account and I am now sooooo hooked on SCANDAL! I am OBSESSED! It really is a problem, but I love it! 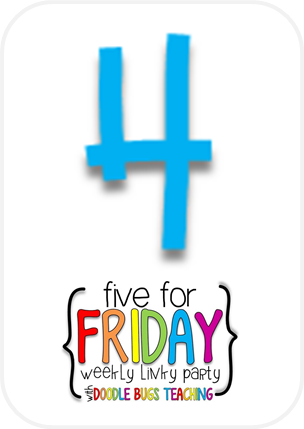 Okay so maybe this is breaking the rules, but my #5 is something that I DO NOT LOVE. This is my pile of mail that has been getting bigger all week, just sitting on my table, waiting for me. Not looking forward to going through it! Yikes! That's all for this week! Woohoo for the weekend!